Click here if you can't read the code. so we can send you a new password. Please enter a name for this configuration. Please select options for the PDF. From the menu above you can either choose Application to start a new selection or Saved configurations to retrieve a previously saved selection. From the Application menu you can choose how you would like to perform the analysis: Standalone Performance or Applied Performance. The Standalone Performance allows you to select inlet air conditions (either user-defined or derived from a leading standard) and the type of OXYCOM heat exchanger. Your preferred airflow determines the cooling performance or heat recovery efficiency. The Applied Performance allows you to select a design condition from location throughout the world. It then asks you to choose an OXYCOM technology and to dimension a certain space to be cooled. The Selector calculates the required amount of heat exchangers and shows the corresponding pressure drop, energy consumption and water consumption. Please login if you are already registered or create an account to get access to the OXYCOM Selector. 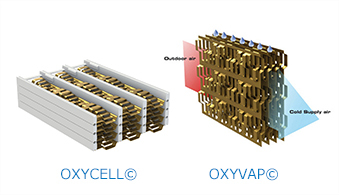 OXYCOM Selector is an online tool that helps you selecting the right OXYCOM heat exchanger for your purpose. It allows you to analyse the cooling performance or heat recovery efficiency based on inlet air conditions and airflow, which are both user-definable.